Red and blue moon, blue due to ozone in Earths atmosphere. During the totality we came in the house to warm up some, and I thought maybe NASA would be running something on their channel, but no. Maybe the government shutdown prevented any coverage from the ISS or from the LRO LROC wide angle camera, but of course there is nothing. No updates yet for the astronaut photos from the ISS, who of course could see the Moon only through Earths atmosphere if it happened to be visible during the orbits. So, as usual, no proof that the Moon itself is even visible from outside of Earths atmosphere, and certainly no proof that the surface of the Moon was actually red or blue at any time during the eclipse. Here's a colour view of the Moon from Apollo 13 from fairly close range, just for a brightness comparison. Proof that the Apollo 8 astronauts could not see the Moon from cislunar space! 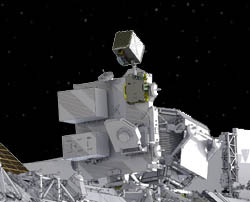 Of course I can't prove the Moon was not visible if they has been facing it, but it is fact that the guidance and navigation computer could quickly orient the craft in any direction and that a camera mounted on the window bracket could be pointed very accurately at any target by the same navigation computer. Looks like no images of the recent eclipse will be available from the ISS. The recent astronaut photos have been updated but the dates jump from the 18th Jan to the 24th with nothing between those dates. I guess when you've seen one eclipse you've seen them all, boring. An image from OSIRIS-REx, Bennu, Earth and Moon in one shot. This must have been a long exposure from the PolyCam, but no stars are visible. The image was apparently de-focused in order to make the Earth and Moon visible. Maybe the stars were too faint to detect when they did that? "An image of the Andromeda Gallaxy taken by a prototype of the MapCam"
Of course the MapCam was being tested from Earth. Will we see similar images from space? The latest public images from Thule flyby is a 10 frame video that shows stable stars in the background. And some that move very fast and blink. The LORRI instrument CCD covers 300-1200nm with no filters so who can say if anything it sees is at visible wavelengths. The unit was used as a star tracker, so of course it can detect stars, but the science involved with these devices, both hardware and software is highly advanced and very complex, and much of the software classified. Uses things like sub-pixel spatial resolution interferometry with interlaced stitching, and the structure of the CCDs means they can also be used as gratings. I guess the last thing they would want to do on a day off is look at another boring eclipse. Here is a piece of ISS hardware that has no problem looking out into space. Examining neutron star emissions. Really? Its 'photos' can have exposures of up to 30 minutes or so, showing how stable a platform the ISS is. No budget though to put a Nikon D5 out there and do some astrophotography, too bad. Cargo wrote: The latest public images from Thule flyby is a 10 frame video that shows stable stars in the background. And some that move very fast and blink. There are no stars in that video. Stars would be fixed in the background of a flyby. Stars only move when the camera/satellite is rotated. It's dust. It seems some of the objects are situated behind Thule so I suspect there are actually other distant asteroids as well. I'm not sure how that's possible for the bright objects which appear to be behind Thule, and we are looking at the near dark side of Thule, so the local light (Sun) orientation is in front of the camera at about the 2o'clock position maybe. That's some seriously bright dust, and the reflection angle is all wrong I would think to shine that bright. I would also note, that the background lights move down and then back up. As if the camera is trying to track Thule as it enters the frame. Or maybe the frames we are seeing are form a much larger FOV image. What's left unsaid I think, is how far from Thule, and what was the velocity delta. Heck, what kind of orbital pattern or period is happening between this encounter and the previous picture? Is this the 2nd flyby? Attached is a cheap line draw of one light pattern in the field of view. It doesn't show in my crop of the frame, but if you watch the gif move, it seems to go down 4oclock, then back up towards 2olock. Cargo wrote: I'm not sure how that's possible for the bright objects which appear to be behind Thule, and we are looking at the near dark side of Thule, so the local light (Sun) orientation is in front of the camera at about the 2o'clock position maybe. That's some seriously bright dust, and the reflection angle is all wrong I would think to shine that bright. 1) Some only appear in one frame. A particularly bright spot appears near the bottom in the second last fame only. What happens to these stars in the other frames? 2) The LORRI is fixed to the body so to track you need to rotate the whole craft. But why is the craft rotating right to left? It should rotate left to right to track Thule. Seems pretty stupid to increase the speed of Thule through the frame by rotating against it's passing motion. 3) The exposure is 0.2 seconds. There seem to be far too many densely populated bright stars for photos only exposed for 0.2 seconds. Also bear in mind this instrument picks infrared as well as visible wavelengths. Not sure what wavelength these images are. Given the very narrow angle lens of LORRI and the speed the craft was moving at I am very impressed at the abilities of the technicians to capture anything at all, good work. As for what the new generation of 'cameras' is detecting. I don't think there is any info available that we could make sense of, they don't function anything like a consumer camera, which would have seen absolutely nothing out there, as would a pair of eyeballs. Sadly but not unexpectedly there seems to be no further information about the Chang'e 4 lander or rover on the lunar far side, even on the Chinese sites. Surely they could have afforded to include a simple light meter among the experiments, I'm really interested to know just how bright the light is, but seeing as we don't even know the light levels on the near side, not surprising. This page has more photos. The first one shows how the viewing angle affects the brightness of the surface. The Sun is behind the camera and on the surface the far side of the crater rim is highlighted, the crater is in deep dark, but the surface in front of the craters must be very dark too, as the Earth is overexposed to get the surface to be visible. The overlapping craters are interesting and my interpretation is that the bigger one at top left was the first discharge, then it moved down to the rim and discharged again, then moved down again perhaps a few more times. This I would say is because the electron density declined during the discharge to it jumped to another location with more available, a crater chain sort of event. Better luck to them on their next attempt. 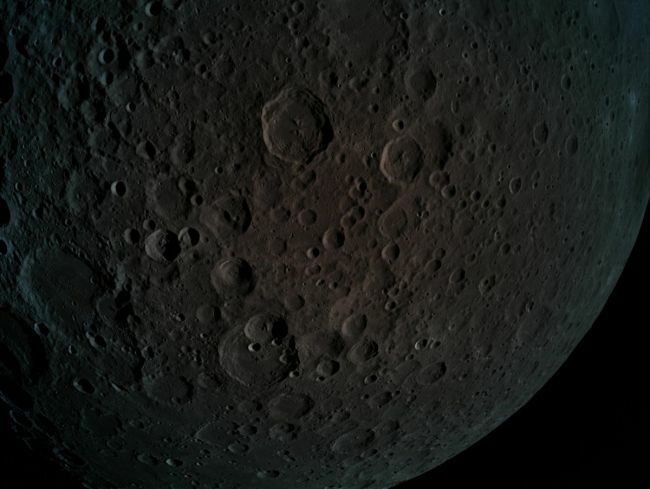 A view of the Lunar far side on April 4 from the Beresheet camera. The far side was fully illuminated but seems much darker than a fully illuminated near side. Exposure setting I'll be told. Well maybe, but for now I'm going to believe this is one if the best far side photos ever and very close to what our eyes would see. None were taken during the Apollo missions as the far side was dark and all subsequent missions used devices that were detecting surface material spectral lines. It would be nice to see some actual luminance values but we do not know exposure settings so can not work out values even with the camera CCD specs.One thing I would bet my last dollar on though is that when, and big if, anyone ever spends any time on the near side, they will never report seeing the colours on the lunar surface that we see from Earth during similar eclipse conditions, they are due to Earths atmosphere. Which is the correct intensity? Hi Frank, not sure of Davidsons model, have to look it up. The SAFIRE experiments so far would seem to confirm my model of the concentric double layers, each having the ability to 'squeeze' the matter in them, and the inner layer in my model would be the iron one. When that double layer is breached for some reason, than yes there would be what is called a nova by mainstream. We see from supernova images that the iron appears at the outer edges, it has more energy, just as was predicted by one of the ancient Greeks, forget which one.